Shrugs and wraps have become such an important part of my wardrobe, easy to layer for different seasons and comfortably soft. 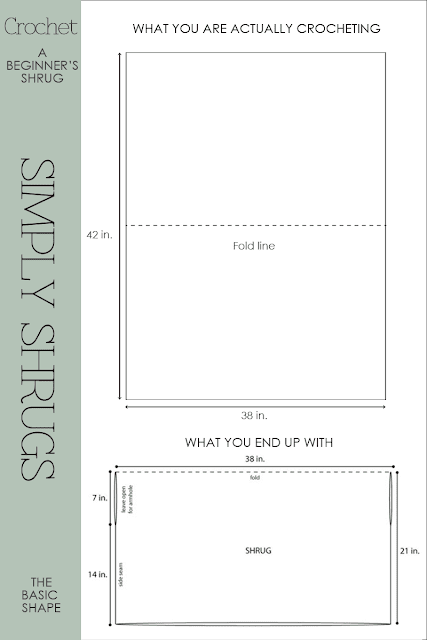 Additionally, the shrug featured above is super easy and the "pattern" is free. There is very little patternwise, just the amount of chain in the beginning and how long the piece of work is. Basically you are crocheting a rectangle, folding it in half, sewing the sides together, leaving the armholes free. Presto, a shrug! You can't get any easier than that. Read further for measurements of rectangle, crochet tips and how-to videos. The schematics or drawing of the garment's shape gives you the dimensions you are to work to. Visually you see how the garment is made. This particular design is very forgiving. Whether the rectangle is 1-2 inches longer or wider will not affect the wear that much. As long as you are getting the dimensions as specified in the drawing, you will achieve the desired results. It is always best to make what is recommended in the pattern first, then experiment with different yarns weights and guages. What yarn do I use? Worsted Weight yarn would be the best choice for a beginner as it works up quickly and is universally available in all price ranges and qualities. An alternative that is popular is Bulky Weight yarn which is also available in all price ranges and qualities. Do I have to worry if my stitches are loose or too tight? Sizing can be an issue when making a garment and I've seen some real "misfits" which is why this shrug is a wise and safe choice. Not only do you get to practise your basic skills, but in the end you get something that will fit, looks good and more importantly, has been personalized by you. Fashions that have a "handmade look" are very popular and can be pricey. What stitch do I use? There are many easy-to-follow crochet videos and step-by-step instructions available online on how to begin to crochet. As a beginner, I would also recommend working the shrug totally in dc - double crochet. This easy stitch can be worked up in stripes or in a combination of yarn types, such as tweeds with solids or multi-colour yarns. The possibilities are endless and fun to try. To help you get started are two videos produced by Lion Brand Yarns. Be sure to visit their website and Youtube channel for other helpful videos and information on yarn types, weights and begiining to crochet. How To - Crochet 911 - Craft Council site with common problems that crocheters may come up against and how to deal with them. Helpful Hints - Pinterest Pins - Pinterest with pins that you can access with different hints and tutorials.